The Sterilco Steam Sterilizers are designed for applications in laboratories for sterilization of materials such as instruments, textiles, rubber goods, liquids, agars, animal diet, cages etc. The sterilizer can be constructed as a single or double-door unit. It is designed for mounting on a concrete floor that contains an open drain connection that is provided by the owner. Constructed in accordance with ASME Section VIII, Division 1, for unfired pressure vessels and so stamped for 45 psig/144 °C Design Temperature and Full Vacuum. The chambers are rectangular in design and jacketed. The chamber is 316L stainless steel with fully welded construction. Steam baffles are positioned in the chamber to minimize wetting by condensate and ensure proper steam distribution within the chamber. The chamber is mechanically polished to a 50 Ra. As option, the chamber can be polished to a 25 Ra or a mirror finish with a Ra of 10u inch or better. This feature greatly enhances the sanitary aspects of the chamber, as well as the clean ability, which translates into longer lasting more aesthetically pleasing sterilizers. The jacket is constructed of 316L stainless steel, is ASME stamped for 45 psig/144 °C Design Temperature. 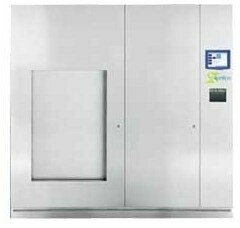 The sterilizer is equipped with a horizontal sliding door. The door is electric motor driven and opened and closed by pushbuttons on the operating panel. The door is equipped with double safety devices to ensure the door cannot close if an obstacle is in the doorway. The first is a leading edge strip which automatically reverses the door should an obstacle be encountered. In addition the door closing mechanism is equipped with a clutch that allows overriding the door closure should the leading edge fail to reverse the door. The door is sealed by air pressurizing the continuous O-ring gasket, which is recessed within the chamber head ring against the door. The gasket is retracted by vacuum before the door is opened. The exterior of the jacket is covered with chloride-free 2” thick insulation. The insulation is encased within sturdy galvanized sheet. The sterilizer chamber is secured to a structural frame. The frame is constructed of 304 stainless steel. Adjustable screws at the base of the frame allow for leveling during installation. The front of the sterilizer is covered with 304 stainless steel fascia panels finished with a number 4 finish. The fascia panels are hinged and equipped with a key lock to aid in access to the maintenance area. All piping in contact with steam is made of 316 stainless steel. Jacket and other service piping is copper or brass. All plumbing fixtures and components are readily accessible and removable without requiring major disassembly of the unit. All control valves are non-proprietary, industrial-grade, pneumatic driven and made from red brass. If air is not available at your facility, an optional integral air compressor can be added. A safety relief valve is equipped on both the chamber and jacket to protect from over-pressure. The safety relief valves are factory preset for the vessel design pressure and are ASME approved and stamped. The chamber is equipped with two stainless steel 1 ½” tri-clamp ports for use for validation and for use by a load probe if equipped. Each is equipped with blind flanges. They are located in the maintenance space for easy accessibility and are sloped towards the chamber for proper drainage. Additional ports can be ordered as an option. A Two-stage water ring vacuum pump in block construction is equipped for silent operation and high performance. The vacuum system is integrated into the sterilizer and is equipped with a rotary current motor, trap valve, counter-flow heat exchanger, and a unique water saving circulation system which include a waste water separating tank and a thermostatically controlled water saving circuit for additional water saving. This system reduces water consumption by more than 70% from standard water ring vacuum pumps or water ejectors. Exhaust cooling protects the facility drainage system by automatically mixing effluent with cooling water to reduce the temperature to an acceptable level. A temperature sensing device located in the exhaust drain opens a mixing valve to introduce cooling water whenever the temperature exceeds the set point. This feature greatly reduces cooling water consumption. Discharge temperature is influenced by the temperature of the cooling water supplied; however, it will typically be 60 °C (140 °F) or less when cooling water is 21 °C (70 °F) or less. The microprocessor based control system provides full automatic control of all the sterilizer functions. The double-microprocessors in a master slave configuration, allows for independent checking of process data and double control for safety. The control system is equipped with a RS 232 port for connection to a PC or network. The control system is mounted in a UL Listed NEMA12 panel. Advanced 8” touch screen allows cycle programming and indicates the sterilizer operating state. Alarms are announced audibly and indicated in clear text. The operator interface is mounted on the front fascia, on the loading side of the sterilizer. Fourteen (14) programmable cycles are available with a wide range of programmable parameters, which provides for a high degree of functionality and allows great freedom in designing cycles for various loads. Cycle parameters and calibration are protected from unauthorized access with pass codes. Dual RTD’s provides the precise control, evaluation and regulation of temperature inside the chamber. Absolute dual pressure sensors are equipped for the precise control of pressure in the chamber and jacket and vacuum in the chamber. Indication of chamber temperature and pressure in digital graphical display are indicated on the operator interface and printed. Complete automatic diagnostic system displayed on the operator interface and printed on the printout. To allow a safe entry into the chamber, the door control system can be locked out for personnel safety. The chip card system allows storage of individual cycles for a specific operator to a chip card. Once the programmed chip card is inserted into the provide slot on the control system, the sterilizer will automatic run the stored cycle. In addition to the fourteen cycles available with the control system, adding this system allows an unlimited number of cycles that can be stored. This chip card system is also quite useful for upgrading the sterilizer program should an update from the factory become available. The new program is mailed on a chip card and once inserted into the control system slot on the front of the sterilizer, the new program is automatically down loaded. The following cycles are preprogrammed for ease in use. The programs can be custom programmed to a user’s requirements. Seven programs are free for the user to program. An optional chip card can be purchased for unlimited programming. This cycle provides effective sterilization of hard goods, filters, linens, and other porous materials, wrapped goods, and product that is unaffected by vacuum. This cycle is also highly effective at removing moisture from the load during drying. At the end of the cycle, air pulses can be initiated to aid in drying. This cycle effectively sterilizes liquid products or items in vented or sealed glass containers. Exhaust ramping gradually returns liquids to a temperature below boiling. A movable RTD is equipped inside the chamber for placement into the product. The RTD ensures that the liquid is below the boiling point before the chamber door is allowed to open. Program P6 – Vacuum Leak Test – Verification of chamber piping and door seal integrity. The acceptable maximum leak rate is 1 mm HG/min. over a 10 minute period following a fixed stabilization time. Program P7– Dart Test – For verification of effective removal of residual air in the chamber and load during testing. Test cycle determines if even and rapid steam penetration into the test load has occurred. Cycle parameters are preprogrammed and fixed.